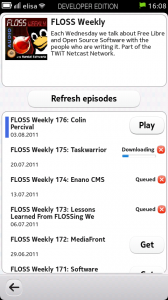 Introducing Podcatcher for Nokia N9 | Comments, Code and Qt. I want my podcast client to be simple to use. It does not need to have many views and I want the UI to be clean. But it has to provide all the necessary functionality. 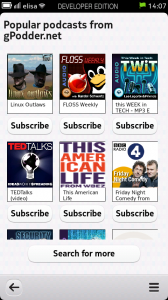 The first screen presents all the podcasts that you have subscribed to and a direct way to add more subscriptions. From here you can access all the subscriptions and their content. The podcast subscription page presents you with the podcast's information and the latest episodes as you would expect. 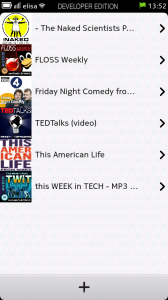 From here you can listen to downloaded episodes, download more episodes, refresh the subscription and watch individual episode's information by tapping on a episode in the list. Please also note how downloads are being queued if you want to download more episodes at once and that you can cancel a download and queuing of an episode at any time. Podcast subscription with episodes. Downloading in progress. Why I like the subscription episodes page so much is the fact that you will always have the latest episode available for listening. If there's a new episode available from the podcast subscription, it will be automatically downloaded to your device where it will wait for you when you arrive to the podcast subscription page. But Podcatcher for Nokia N9 will also take care of your data plan - it will only download episodes automatically if you are connected to a WiFi network. 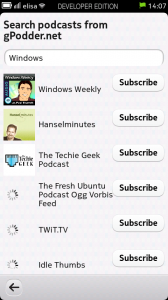 Upon launch all podcast subscriptions are automatically refreshed and new episodes downloaded. This is how I like it - I subscribe to some podcasts, but I don't want to do any manual operations to have the latest episodes available. They are there waiting for me. Naturally you can also download older episodes manually. Podcatcher for Nokia N9 places all downloads in a queue and download them in the background one by one. If you don't like some episode, just cancel the download or the queuing. Something I wanted especially to be easy to do is to add new podcast subscriptions. Thanks to gPodder.net, you can easily subscribe to their most popular podcasts. You can also search from their service for additional podcasts and subscribe to them right from the search result list. Or if some podcasts happens to be missing from gPodder, you can give the podcast feed URL manually as well. Any chance this making its way to Symbian too? Podcatcher for Symbian works well most of the time, but has some annoying bugs and the development has slowed down to an almost halt. So this why you havent updated the S^3 version, been busy. I have not written the Podcatcher for Symbian. Oh sorry, my mistake. Using the same name i assumed you would be the same developer. In that case, one hopes you find the resources to develop a version for Symbian. Thanks, i have a C7 too if you need help testing. Is there an option to not auto download. I listen to mostly audio podcasts, one episode is about 50 megs (that’s a bit much too). I think one automated download of a new episode per channel is quite reasonable on a modern smartphone. This was the main reason for me to write my own podcast client. When a new episode is available, I want to have it right away on my device – that’s why I subscribe to the podcast 🙂 And you can cancel the download, delete old ones and re-download episodes with one tap. I will add settings in a next version. Delete all downloads at once for a subscription will be there before the release. Happy to let you guys know that auto-download is now behind a setting so you can control it yourself! Another feature i would love is, if filesize over a limit say 100MB dont auto-download, but i guess this doesn’t work in all use cases if the file size is unknown. But also, I experimented with the applications settings FW that Harmattan provides for the apps. And I am sad to say but it’s more braindead than I expected. So adding settings was not as straightforward as I anticipated. I still want to do settings (with the configurations you mentioned), but I need to figure out how. 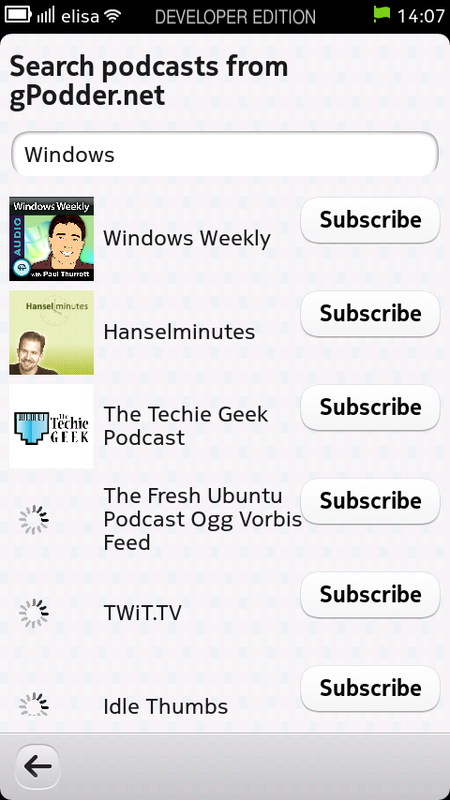 Maybe you’ve already seen, but the latest version of Podcatcher for N9 includes settings to controlling the automatic download. I’ve also added settings for some other cool stuff. To ability to listen podcasts at double speed would be highly appreciated. When this program can be downloaded? Thanks I have just downloaded your player for N9 (I usually listen to my podcasts on the iPhone) and I have to agree that double speed is an essential feature that is missing. Also, compared to the free ‘Podcasts’ tool, there doesn’t seem to be much functionality your product offers, in fact some of the feeds I am used to using in iTunes, also work in the Podcasts application, but not in Podcatcher…really disappointing. Another thing I am missing is that it doesn’t remember your place when you reopen a podcast. I am going to delay writing a review and keep my fingers crossed that some of these things will get fixed in a future release. Well – there isn’t much I can do for double speed, as I launch the default media player. The same for remember the place; I want to add that, but I cannot do it with the default media player as it only lets me launch the audio file from the beginning. I could, of course, make my own player for podcasts, but my original focus was an app that manages podcasts – not play them. Can you please send the feeds that do not work to me at podcatcher@d-pointer.com, thanks! I look into these as soon as I know a feed that doesn’t work but obviously I haven’t tested all of them. And for the record, so far the reason in most of the cases that the feed doesn’t work is that the feed is malformed. I try, of course, then to compensate for this in my parser. I’ve now added some robustness to the podcast feed parsing. If you have the feeds (URLs or the name of the podcast) that do not work, I could verify that those work now. Or look into them if they still don’t work. Just to be sure, I would like to let you know that I’ve submitted a new version of Podcatcher for N9 to Nokia Store and it should be available within a few days. This version should fix more issues with subscriptions. If not, can you please send me your feeds that do not work and I can make sure they work. 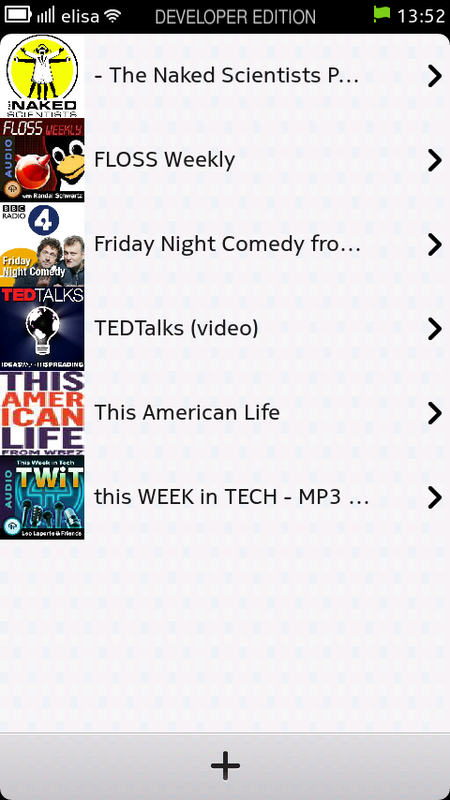 To anyone interested, I’ve added two requested features to Podcatcher for N9. Or actually just one to the N9 version: podcast streaming. Now you can simply long-press on a undownloaded episode and you can stream it and listen to it without downloading. The second requested thing is that Podcatcher has been ported to Symbian. It is on its way to Nokia Store and will be called Podmaster on the Symbian devices!